170 Commercial Real Estate and Properties in Victoria Country North are listed in 8 categories. 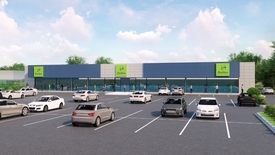 We have 79 Retail Shops for Lease , 47 Offices for Lease , 18 Commercial Farms for Lease , 16 Industrial Warehouses for Lease , 5 Showrooms for Lease and 3 Development Lands for Lease . Renovated Office Space In The Cbd $104,000 p.a. + GST &..
Fantastically Appointed Large Office Space $52,000 p.a. + GST & ..
Food Opportunity On Langtree Avenue $52,000 p.a. 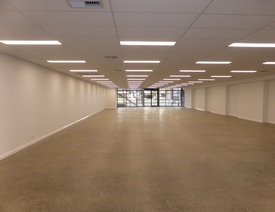 + GST & ..
Medical Offices With Refurbished Fitout $35,000 p.a. + GST & ..
Upstairs Office In Modern Building $20,000 p.a. 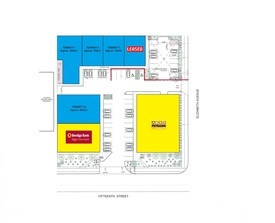 + GST & ..
Prime Retail Opportunity $38,000 p.a. + GST & .. Shared Office / Professional Office Suite Rent: $800-00 plus GST pe.. Shared office environment, offering complete flexibility for your business, available now. If you have outgrown your home office, but not wanting to be locked into a long term lease or the expense of an office, when you are only using it part time, why not relocate your office here. Located in Horsham Real Estate's business centre we have 2 large offices available, plus furniture if you require it. Complete flexibility with lease terms. The secure office is operated by an individual tenant password/swipe tag. Completely climate controlled, this office suite also features new carpets and paint as well as stylish office furniture in a modern environment. Rent amounts include the exclusive use of one secure office and all shared staff facilities, all power, council rates, water rates, climate controlled heating/cooling units and cleaning. Public Liability & Contents Insurance will be at the expense of the tenant. Boardroom also available for hire per sessional basis. Seats 20 in boardroom or 40 auditorium. Separate private room for catering/tea/coffee. Inspections welcome, call Nola today to arrange a suitable time on 0418 504 855. Rent: $800 00 per calendar month plus GST. [Cheaper rate if both offices leased]. Outgoings: No outgoings. Power, water, heating, cooling, rates all included in rent. 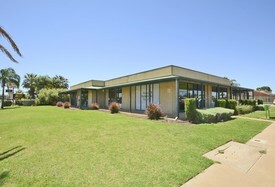 Prime Office Space On Deakin $10,000 p.a. + GST & .. Excellent Warehouse And Yard In Irymple $50,000 p.a. + GST & ..
Large Warehouse With Yard In The Cbd $80,000 p.a. + GST & ..
With a bumper harvest nearly completed, if you are looking for more country then look no further than this local fully established vineyard in a great location with good soils & infrastructure. With a total land area of 26 acres and 1 acre house block on separate titles. Approx 12 acres Cabernet, 4 acres of Sun Muscat & 10 acres fallow with trellis, watered with a combination of overhead sprays and under vine drippers. Near new pump, workshop and chemical shed. The house is a comfortable 3 bedroom, 1 bathroom home which as it is on a separate title has the potential to rebuild or subdivide STCA. Town water is also connected in association with AUL of 89 Megs. With wine and fresh fruit production in high demand this one is really worth a very close look. A rare opportunity to acquire a substantial Vineyard holding in an exceptional location planted to a variety of dried fruit and wine grapes. Comprising 2.1 ha Petit Verdot, 4.7 ha Chardonnay, 4 ha Merlot, 6.4 ha Carina currant, 9.4 ha Sun muscat and 10.7 ha of Sunglo. The property enjoys a centralised irrigation system with 428ml of AUL. Improvements include 25m x 18m shed, office, kitchen and cool rooms. 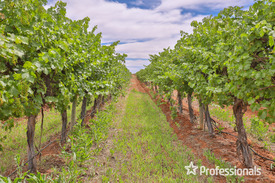 This is a high performance vineyard, showing excellent production figures. Contact Tony Roccisano on 0418 502 101. 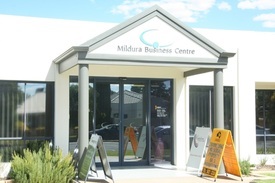 Mildura Business Centre $8,000 p.a. - $18,900 p.a.. Superb Office Accommodation $1,837.50 pcm plus GST & ..
Work From Home - Dimboola Rent: $1083 pcm plus GST .. Located right in the heart of Dimboola is a great retail shop with attached modern 2 bedroom residence. Situated between the Bendigo Bank and a busy menswear store, directly opposite the newsagency, locations don't get better than this. 2 large display windows lead into a large retail floor space with polished timber floors, white walls, high ceilings and plenty of natural light. At the back of the shop is a great size kitchen, timber floors, modern timber kitchen, electric cooking, wall oven, rangehood and double sink. 2 good size bedrooms, new carpet, freshly painted and modern bathroom. Externally there is a long yard, new fencing and carport. Land area: 275 sqm Rent: $250 per week plus GST & Outgoings. Outgoings: Council Rates, Water Rates, Plate Glass Insurance, Public Liability Insurance. Lease: Flexible Lease terms available. This is the ideal place to work and live. Call Nola today on 0418 504 855 to arrange a time to inspect. Exciting Opportunity To Lease Rent: $1370 plus GST per .. This main street property has been occupied by a hairdressing salon since 2003 and Mink Hair, a successful salon for the past 10 years. This is your opportunity to carry on the tradition or change to suit your business needs. 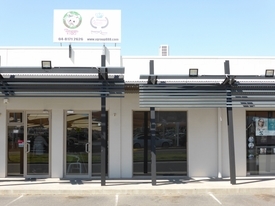 Features of the property include modern shopfront windows, with heritage lead light glass, tiled floor, evaporative airconditioning, gas heating, suspended ceiling, excellent retail lighting, staff room with small kitchenette, plus separate toilet for staff. Plus additional Ladies & Gents toilets for customers. Externally there is a yard for staff parking, adjoining a large public car park. Rent: $1370 per calendar month plus GST Outgoings: Council Rates, Water Rates, Plate Glass Insurance, Public Liability & Building Insurance. Call Nola on 0418 504 855 to arrange an inspection. Opportunity In Established Fast Food Area $50,000 p.a. + GST & .. Fantastic Exposure $20,000 p.a. + GST & ..
Retail/office In Sought After Location $43,500 p.a. + GST & ..
Busy Madden Avenue Opportunity $40,000 + GST & Outgo..